Nevada City’s Annual Summer Nights Celebration is an outdoor festival of art, music, and gathering. For three Wednesday evenings each Summer from 6pm to 9pm historic downtown Nevada City closes its streets to motorists. Broad Street, Commercial Street and Pine Street are alive with locals and tourists. The streets are filled with arts, crafts, classic cars, food, drink and music. Leading musicians from the Sierra Foothills perform on outdoor stages. For more than a quarter of a century locals have enjoyed the Summer Nights celebration in historic downtown Nevada City, CA. Spend an evening walking the streets to the music of local artists, enjoying the diverse cuisines, and mingling with residents and visitors. You will get a taste of the unique community in which we live! 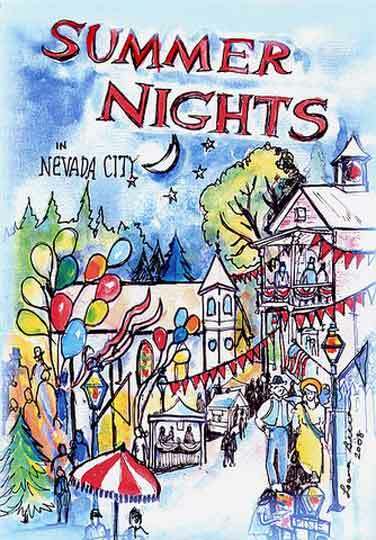 Come join the fun and enjoy the warm Summer Nights in Nevada City! For more information visit the Nevada City Chamber website.